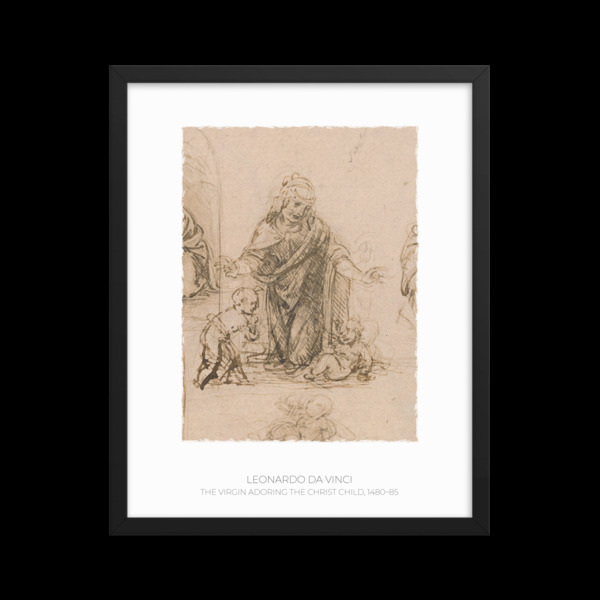 In these dazzling sketches of the Virgin kneeling in humility before the Christ Child, who lies on the ground, Leonardo investigated a theme that he would also use in the Virgin of the Rocks (Musée du Louvre, Paris; and National Gallery, London), in which the Virgin kneels facing the spectator, her right hand raised in protective blessing over the seated Infant Jesus. The composition in the center is closest to the Virgin of the Rocks. These sketches, however, seem more closely related to an undocumented painting from around 1483-85 by Leonardo that must have been brought at least to the stage of a complete cartoon (full-scale drawing); several contemporary painted copies of this composition survive. Leonardo explored a number of solutions to the same theme on the sheet with dazzling fluency. He used the traditional fifteenth-century medium of metalpoint but reinforced the shadows with pen and ink for a deeper tonal contrast. The geometric constructions at the lower right represent his attempts to work out the perspective within the composition, with respect to the spectator's vantage point.